Building on the success of the Drift HD Ghost, the Ghost-S crams even more new features into an already feature-rich package without sacrificing quality. The Ghost-S takes an already great action camera and makes it even better. 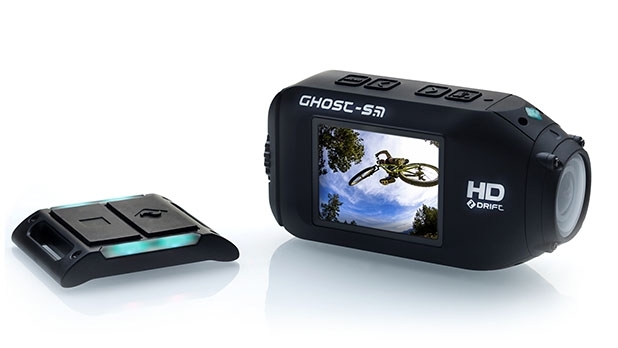 With higher quality images, new recording settings, and tools for managing multiple cameras simultaneously, the Ghost-S is a great choice for users who want the most from their action cameras. The Ghost-S has the same design as the Ghost. It's somewhat blocky body is roughly 4 inches long, 2 inches high, and 1.3 inches wide. It's no lightweight at 5.9 ounces, but it's still small enough to strap to a helmet or pair of goggles. The 2" Gorilla Glass LCD makes a comeback along with the buttons on the top for controlling playback and menu settings. As expected, ports and jacks can be found on the back of the camera. To keep this area airtight, Drift uses a dial that you twist to unlock the back panel. While this could be difficult for gloved users, the camera comes with a mount designed to help undo the lock when your fingers can't quite cut it. The Ghost-S bumps up the frame rate to an industry standard 60fps 1080p. The other resolutions have also gotten a boost, with 960p bumping up to 60fps, 720p to 120fps, and WVGA to an incredible 240fps. The camera's field of view (FOV) has been reduced to 160° across the board, though 1080p still supports 90° and 127° FOVs. The lens can be rotated up to 300° for easy mounting in any direction. The sensor in the Ghost-S can now take 12 megapixel photos, with a burst mode of up to 30 photos a second. Time-lapse photos can also be taken at intervals ranging from 0.5 to 60 seconds. Drift has added new scene modes for adjusting colors on the fly, which resolves some of the color and low-light issues with the Ghost. In general, images are sharper and less noisy than the Ghost. Despite its powerful new features, the Ghost-S sports the same 3.5 hour runtime as the Ghost. As before, the battery is replaceable, making it easy to take the Ghost-S out for an entire day of filming without having to touch a USB cable. In addition to the features of the Ghost, the Ghost-S provides a Clone mode for managing multiple cameras simultaneously. A single Ghost-S camera, designated as the master, can be used to control recording for up to four other Ghost-S cameras. It's a nice feature for professionals, but not one that we expect most users to take advantage of. Because both cameras share the same form factor, the Ghost-S can use the same accessories and mounts as the Ghost. The Ghost-S takes an already great camera and makes it even better. While the price tag puts it more in the professional range, the quality and feature set will perform well in the hands of any photographer.